The following statement was written by Robert Haines – coordinator of the Harry Kremer Award. 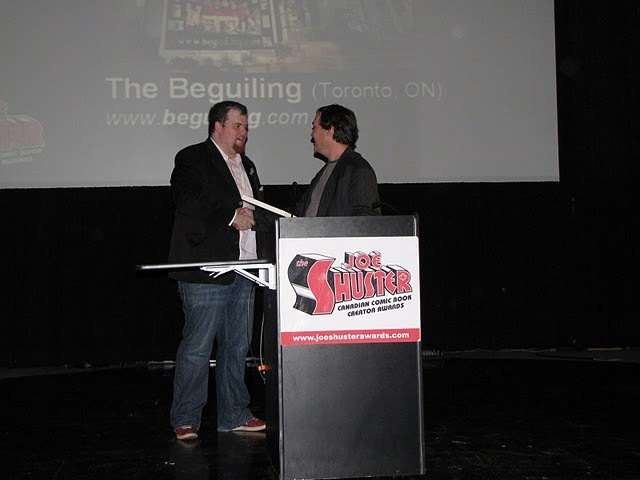 The Beguiling is a multiple-year Kremer Award nominee, an Eisner-Award winning store that is often referred to as one of the best stores in North America. Really, they were competing against themselves last year. What did The Beguiling do in 2009 that was above and beyond what they normally do? The largest reason behind The Beguiling being selected Outstanding Retailer of 2010 was for the fantastic and consistent job they did in promoting Canadian talent and really turning up their community presence and support with events such as Word On The Street, numerous book launches and in-store signings promoting the works of Canadian creative talent, working with Canadian publishers like Drawn & Quarterly and Conundrum Press, working with the Toronto Public Library system, and finally for the excellent Toronto Comic Arts Festival – 2009 was the year that the Festival moved into the Toronto Reference Library and was upgraded to an annual event. In its long history The Beguiling sponsored many book launches, author signings, readings, and other comics events with legendary creators including Robert Crumb, Harlan Ellison, Jamie Hernandez, Neil Gaiman, Joann Sfar, and literally hundreds more. In 2003 several members of The Beguiling staff founded The Toronto Comic Arts Festival, bringing alternative and independent comics creators from around the world to Toronto to celebrate the best of comic art. The show continues to thrive, growing in size with each iteration.